This is an active product that is not recommended for new designs. Figure 1. Typical Application Schematic. 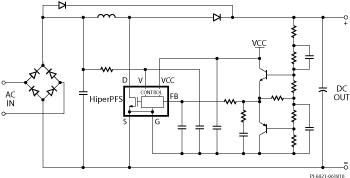 The HiperPFS™ device family members incorporate a continuous conduction mode (CCM) boost PFC controller, gate driver, and high voltage power MOSFET in a single, low-profile eSIP™ power package that is able to provide near unity input power factor. The HiperPFS devices eliminate the PFC converter's need for external current sense resistors, the power loss associated with those components, and leverages an innovative control technique that adjusts the switching frequency over output load, input line voltage, and even input line cycle. This control technique is designed to maximize efficiency over the entire load range of the converter, particularly at light loads. Additionally, this control technique significantly minimizes the EMI filtering requirements due to its wide-bandwidth spread spectrum effect. HiperPFS includes Power Integrations' standard set of comprehensive protection features, such as integrated soft-start, UV, OV, brown-in/out, and hysteretic thermal shutdown. 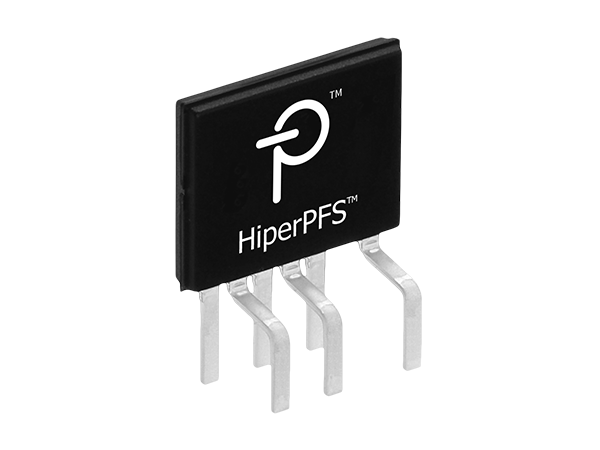 HiperPFS also provides cycle-by-cycle current limit for the power MOSFET, power limiting of the output for over-load protection, and pin-to-pin short-circuit protection. Maximum practical continuous power at 90 VAC in an open-frame design with adequate heat sinking, measured at 50 °C ambient. Lower range of maximum continuous power for best light load efficiency. Maximum practical continuous power at 180 VAC in an open-frame design with adequate heat sinking, measured at 50 °C ambient.